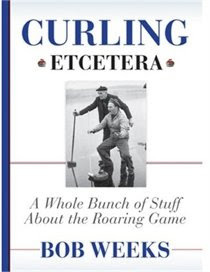 Bob Weeks on Curling: Three 10s in a day -- never again! Yesterday, I played in the zone playdowns for the Ontario Silver Tankard. This is one of the oldest competitions in Canadian curling, dating back to 1875.It's also a double-rink competition -- meaning two teams from one club play two teams from another and the total score of the two games decides the winner. It's a really fun event in which to play, with the strategy changing from normal games. There were only five teams entered in our zone, which was certainly disappointing. But it also created an awkward draw. 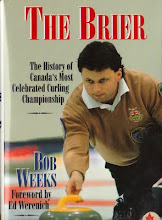 And, as is the case in most of my curling career, I managed to get the bad end of the draw, meaning we needed to play three games to win. That's three 10-end games in one day. We managed to win the first two, a victory over an entry from our own club and then one over a team from Oakville. We finished up with a match against a team from St. George's. That contest was a wild one. In our match, we were up six playing the last end. Our teammates on the other sheet were down seven, meaning we were down one. Under normal circumstances, we wouldn't even be playing the last ends of these games. As it turned out, we dropped one in our game, meaning our teammates needed to take two for an extra end. A last-shot, raise-double attempt failed and the St. George's team moved on. OK, a couple of points. The last time I played three 10s in one day I was still sweeping with corn. Three 10-enders is way too much for anyone these days. I think the Ontario Curling Association should drop all competitions that don't lead to a national championship to eight ends. I can tell you my body this morning would gladly vote for that. I am sore from top to bottom and I am in pretty decent shape compared to the rest of the guys who were on the ice. Second, playing in these competitions is great fun. It's too bad that more people don't go into them. 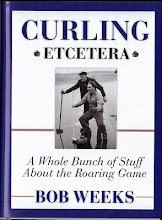 I think curlers should experience this stuff and the fun of playing a competition like the Silver Tankard. But it would seem to make a lot more sense to move something like this to the start of the year rather than the end. By this time of year many people are a) tired of curling; b) playing in their club championships; and c) committed with March break and Easter. p.s. -- a word of congrats to Bill Duck, who was skipping one of the St. George's teams in the competition. I've known Bill since junior days and he's a guy who's made his life all about curling, running the operations at St. G's both from an ice-making standpoint and a pro shop. For the last year and more, Bill grew his hair to great lengths so that it could be donated to make wigs for cancer patients. He also raised a ton of money along the way. Curling needs more people like Bill Duck and charity does too. Congrats to Bill.